She really is a great photographer, a great friend to us, and has some stunning images on her website. Click the link and and see for yourself! Tamsin produced our incredible poster for our 2018 production, Crazy for You. She is a fabulously talented artist, click on her logo to visit her website. George and Callum have produced our lighting and sound for our shows at King Alfred's Theatre ....friendly, helpful and professional, everything we could ask for. Invaluable support from the lovely folk at Newbury Theatre - Thank you! They have a site full of information on theatrical happenings in and around Newbury and Oxfordshire - check it out by clicking on their logo! Visit our friends at Gobo Theatre - a remarkable company that is helping put the next generation of young talent centre stage, by giving young peiople their first job in theatre, paying them a fair wage as they launch their careers. Fair paid is fair played. Click on their logo to go straight to their website for their latest news and activities. A fabulous group of massively talented young people who have a passion for theatre, based in Wantage ..... look out for their next production and don't miss it! More news on their website - click their logo. 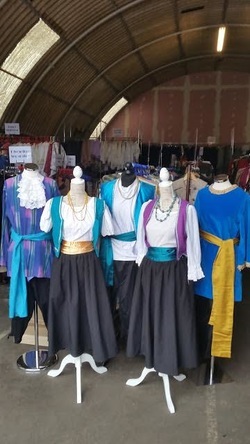 Oxfordshire Drama Wardrobe has a stock of over 5,000 costume and prop items available for hire. We can help with drama productions, pageants and other events. We have costumes from almost every period, from Ancient Rome, through Elizabethan to Georgian. We also have a good range for the Victorian/Edwardian eras, and for the 1920s-1950s ... with a large choice of WW2 allied uniforms. We're happy to discuss your needs with you and to see how we can help you to stage a visually striking play without having to break your budget!